Let the battle for The Jade Empire begin. Here is a game that is pretty important to me. Jade Empire was the first action rpg that I finished. Why was this the first one? I didn’t have the video game attention span to handle a rpg until middle school. For those of you that do not know, action rpg’s are my favorite type of game. Jade Empire was brought to us by Bioware back in 2005 and it did very well when it came to reviews from the major media sources. Unfortunately, it did not do very well when it came to overall sales. It didn’t completely bomb, but there are people who do not know about this game and that is a shame. Well, for those of you that missed out on this one, here is your chance to see what it is all about. The story for this game is very important because Jade Empire is a single-player game. The setting is a fictional world that is obviously based on China. The emperor is a tyrant and his wrath has finally reached the remote land that your character calls home. You have trained your entire life in the way of martial arts and you have a close connection to the spirits that roam the lands. Your master saved you as a baby from an attack by the tyrant and it is now your duty to go on a journey where you will hone your skills and bring peace to The Jade Empire. Basically, if you like stuff like martial arts and Chinese mythology, then you will automatically enjoy this game. Although, you don’t have to enjoy that stuff to enjoy the game. Anyone that appreciates a good story will have fun while playing this. You can skip the cut scenes, but I would not suggest that you do that. The story is easily one of the best ones that I encountered on the original Xbox. Unfortunately, the story is not very long. That has a been a subject of criticism over the years, but that is up to the player to decide. I wish that the game was longer because I play a lot of rpg’s, but people who are not used to long gaming experiences may appreciate the length. I know some lazy people. Just make sure you pay attention during the cut scenes because most of what you see is pretty important. They have some great subtitles if you prefer reading or are playing late at night and can’t have the sound on. You must hone your skills. This is a single-player experience, so don’t expect to get a bunch of people together to play this game. I do think that the story is interesting enough for someone to watch a person playing the game, but that really depends on the person. This is an action rpg, so you will be leveling up your stats and deciding on various fighting style as you proceed along your journey. My favorite part of action rpg’s is the fact that I don’t have to sit through turn-based gameplay. I play my fair share of those, but I prefer the constant action in this one. Things flow pretty smoothly in my opinion. I never had too many issues with the camera angles and the action buttons themselves are simple enough. 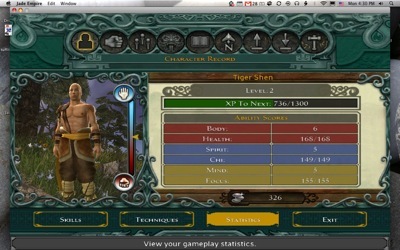 The gameplay in general is not difficult at all. You assign attacks to various buttons and the combos don’t require high levels of precision to execute. One of the redeeming qualities of this game comes from the fact that your starting character can develop in a lot of different ways. 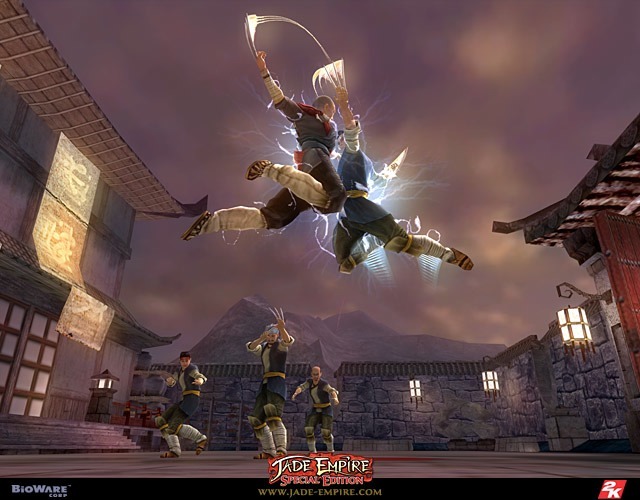 The various fighting styles and weapons give Jade Empire a lot of replay value because your experience can feel different every time you play it. Some people argue that the gameplay was too simple, but I am a firm believer that a game doesn’t have to be punishing in order to be rewarding. Overall, the gameplay is fun without being too challenging. Although a good portion of that trailer was cinematic, you can see the actual gameplay there as well. This game came out in April, 2005, so everything that I say in this section will need the release date as context. As far as the graphics go, this game is beautiful. The scenery is vibrant and it really shows off the Chinese style that this game was going for. The character models are nice and the battle animations flow very nicely. The music in Jade Empire is also something to behold. Once again, it fits the Chinese style very well. At times, I did wish for a little bit more from the music when it came to smaller fights. I found the music during the small encounters to be forgettable and that makes me sad because the rest of the music was really good. Also, the sound effects during fights are really nice. I think that sounds in games that aren’t music are a very under appreciated part of the products as a whole. The battle sounds are meaty and hits just feel satisfying in this game. Overall, I found the graphics to be fantastic for its time and the sounds to be satisfying for the most part. This is a pretty simple system. When I think of this game, various things come to mind. When I think of the story, I think of a great look into Chinese culture. The spirits, the fight for honor, and the importance of martial arts are all very important to the story. I think that it is one of the best single-player experiences that I had during the Xbox generation. When I think of the gameplay, I think of a fun action rpg. I found things to be simple in a good way. You didn’t have to over think things when you were leveling up your stats or search for guides in order to clear bosses. I am not saying that there weren’t any difficult parts, but there were no Legend of Zelda temples in this one. When I think of the graphics and music, I think of a beautiful experience. You really felt like you were a part of a struggle for a Chinese empire. What were some of the best parts of the game? The replay value is pretty great. The various fighting styles provide unique experiences and the romance element gives you quite a few options. One of the interesting things about this game is the fact that you can have an unconventional ending when it comes to the romance. There are homosexual and group endings that can appeal to some players. Also, there is this fun technology in the game that can only be described as DaVinci visiting China. The flying machines are pretty cool. Did I dislike anything about the game? Probably the length of the story. It could have been longer and I think that it would have benefitted from a longer story. Some of the smaller encounters were pretty boring in my opinion, but that pretty much wraps up my complaints regarding the game. Overall, Jade Empire is a great game that too many people missed out on. If you don’t have an original Xbox, then you can try Xbox Live Arcade or Steam. Both are great options to get this game at a reduced price. I picked it up for fifty dollars back in the day. I needed more flying missions.